We’ve got lots of love for the local this week. We talk to restaurateur extraordinaire Danny Meyer about the newest Shake Shack on New Britain Avenue in West Hartford, and we geek out about rum with The Real McCoy Rum founder (and Emmy® award-winning documentarian) Bailey Pryor from Mystic. Former opera singers Kelly and David Boudreaux, owners of Nature’s Grocer, a gluten free market in Vernon and Bloomfield, join the party with a platter of gluten-free treats and the chicken salad they’re famous for. 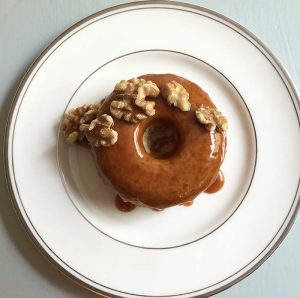 Plus, Kelly and David introduce “The Faith Doughnut.” You can actually order one at Nature’s Grocer now, or doctor one up at home. If you find yourself at Nature’s Grocer, and you’re lucky—Kelly and David might sing something for you—like they did for Faith. Interested in Bailey’s documentary films? You can watch Gluten Free on CPTV Spirit Tuesday, June 12 at 9pm. Bailey’s documentary about rum runner Bill McCoy is called The Real McCoy; you can watch that film anytime at The Real McCoy website. Love everything at Nature’s Grocer especially breakfast on Saturdays we get it for the girls at Classic Shampoo it’s great! !